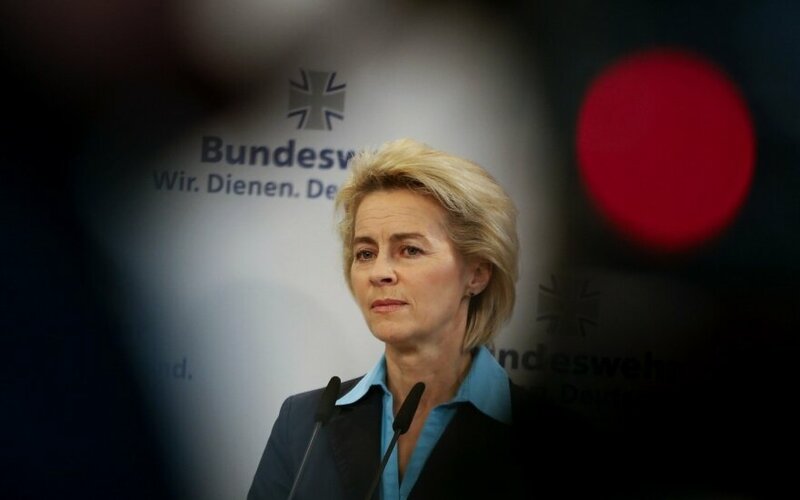 In her congratulatory message to the German-led NATO battalion in Lithuania, Germany's Defence Minister Ursula von der Leyen on Tuesday pledged to defend Lithuania's freedom and independence. She addressed troops in Rukla, elaborating on Lithuania's history, including the German liability for the Nazi occupation during World War II, and later answered questions from journalists about the relations with Russia and the United States. "Next year, the freedom-loving people of this proud country will celebrate the centenary of their independence in modern times. Yet, from the very beginning, their freedom had been under threat. Lithuania stood alone against powerful neighbors who showed no respect for international law, the right to self-determination of the people and the independence of the young eastern European democracies. In the Hitler-Stalin Pact, National-Socialist Germany and the Stalinist Soviet Union divided Eastern Europe between themselves. After less than 20 years, the freedom of Poland, Estonia, Latvia and also Lithuania ended with the stroke of a pen. What followed in 1940 was the nightmare of Soviet occupation: mass arrests, countless executions and the deportation of tens of thousands of people. But there was even worse to come: the Wehrmacht's invasion of the Soviet Union brought many years of misery and destruction to Lithuania. The country fell victim to the Nazi policy of annihilation. In the Nazi plans, there was no room for a Lithuanian nation. Then, the end of World War II and the Allies' victory didn't bring the hoped-for freedom either. Quite the contrary: once again, the country suffered from oppression and the terror of the Stalinist era. For 45 years, the Lithuanian people were forced to live without freedom – but they never gave in." "I vividly recall the first images of the Singing Revolution back in 1990, the dramatic footage of the uneven fight on Bloody Sunday in Vilnius, almost exactly 26 years ago. Back then, the courage of the people defeated a seemingly invincible opponent. Since it became independent, Lithuania has been a success story, admired by all Europeans: it became part of the indivisible Europe of democracy and freedom. It is a respected member state of the EU and NATO. Lithuania boasts a vibrant democracy with a liberal, open society. And it is a country, which dared to leap into the 21st century very early and today is one of the leading countries when it comes to Internet access." "Today, we have come together to declare our strong commitment to the future of Lithuania: never again will Lithuania stand alone. The future of its people is protected by the greatest military alliance of our times. Soldiers from Belgium, the Netherlands, Norway, Luxemburg and Germany will stand side by side with Lithuania to defend your borders. Today, Lithuania is as strong as the combined power of all 28 NATO member states. Never again will the freedom and the independence of Lithuania be sacrificed for criminal power politics of spheres of interest. Neither the territorial nor the political sovereignty of Lithuania are negotiable, ever. All allies of Lithuania honor their Alliance commitments, without compromise. We stand united, so that the people of Lithuania can live without fear and shape their future as they like." "As German minister of defense, I was touched to hear how friendly you welcomed the Bundeswehr soldiers here in Lithuania. Such open arms. We certainly did not take this for granted, since a great share of the historical responsibility for the misery and hardship Lithuania had to endure in the 20th century falls upon Germany. This is why we are infinitely grateful. And we are proud to lead this Battlegroup. 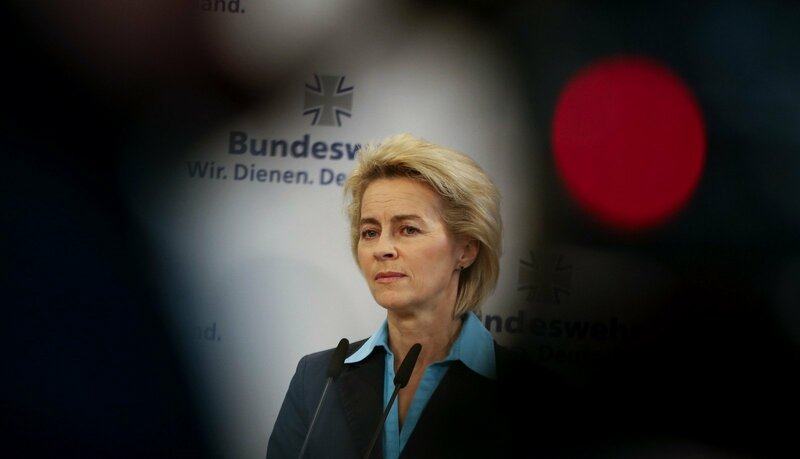 It is a symbol of great trust in the German armed forces, our Bundeswehr. During the Cold War, the Federal Republic of Germany enjoyed the protection of its allies. For this we are grateful and now want to give some of it back. To our partners who now need the Alliance's solidarity and protection. We are happy to oblige and do so wholeheartedly. Because the history of Europe in the 20th century teaches us a lesson: freedom and security are not a given." "We will only be able to defend the democracies of America and Europe successfully if we stand together. And this is exactly what we are doing here today – together, under NATO's blue flag (...). I spoke to my colleague from the US and he restated his commitment to NATO and our continued joint action and shared values. I am going to Washington on Friday to meet with (Secretary of Defense) James Mattis. The telephone conversation left me free of doubt that we will continue the work that has been started." "It is important for us to deter any possible threats. We are taking the action because we want to show our unity." "We have a very long tradition in Germany that obligations have to be fulfilled. We don't know how elections are going to be but there is a strong commitment through all parties in Germany to stick to commitments we promised to fulfill. And there is a strong commitment to NATO, as well as the European Union."